Amateur Barbeque « We're not quite sure how this thing works, but we're up to the challenge. We're not quite sure how this thing works, but we're up to the challenge. Ah, Thanksgiving. Canadian Thanksgiving, of course. A holiday about bringing together family, friends and food… and of course, about being thankful for all of those things. In my family, my parents still cook the turkey (and stuffing, and squash, and potatoes) but everyone contributes something to dinner. This year, we took care of the vegetables. 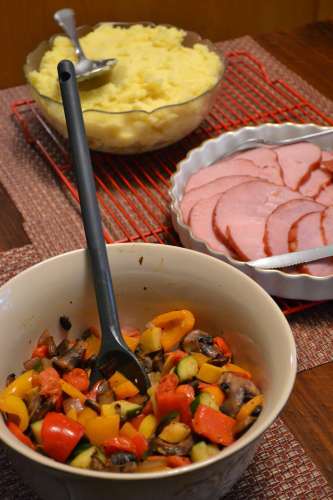 It’s fall in Ontario and this dish has all the lovely colours of the turning leaves. Being outside next to the barbeque meant enduring a bit of rain and the cooler temperatures, but it also meant that hubby and I stayed out of the bustling kitchen and that the oven and stovetop were free for other things. This recipe was enough for about 12 adults. 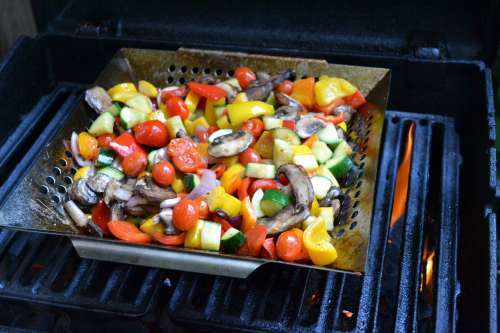 Preheat grill to about 350F, and place the veggie mixture into a grill basket (this just fit into one basket) over direct heat. We stirred it about every 5 minutes for the first 15 minutes, then more frequently for the last 5 minutes. It took about 20 minutes to cook (but if you had less volume, it would take less time). Who doesn’t love barbequed chicken? Our first meal back at home yesterday had to be easy enough to make with the few ingredients we managed to pick up at the store on what was (in Ontario, at least) the holiday Monday of a long weekend. On our travels last week we acquired another grilling cookbook for our budding collection, so we turned to it for inspiration. And I don’t know about you, but beer basted barbequed chicken sounded pretty tasty to us. It also seemed fitting to cook something with beer on a long weekend, and it gave us a chance to try out the side-burner for the first time. 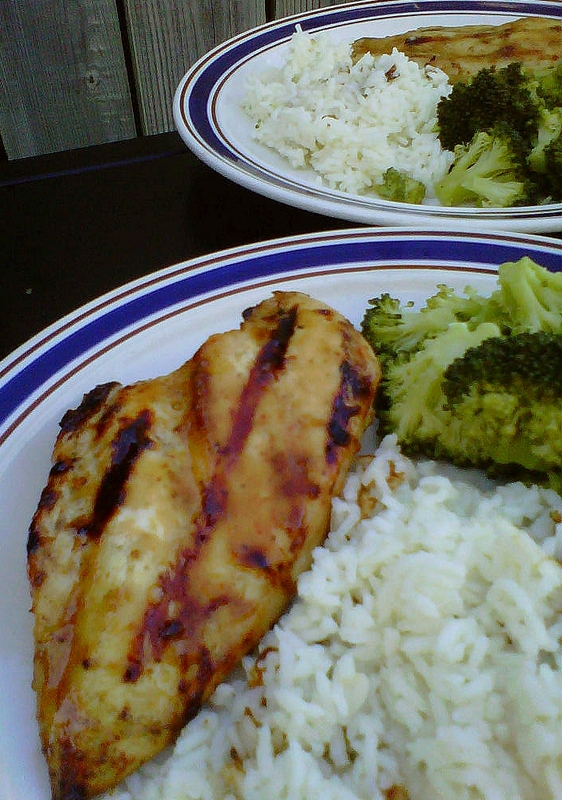 Beer basted chicken, served with rice and steamed broccoli. This recipe is a two part process: first you make a spice rub and apply it to the chicken before refrigerating it for a few hours, then you make a sauce and baste the chicken with it as it grills. This sounded (to me, at least) as if it should create particularly flavorful and juicy chicken and, I assure you, it didn’t disappoint. The original recipe called for chicken drumsticks, but we had boneless, skinless chicken breasts. We made a couple of other variations to the recipe so I’ll post the ingredients we used here, but if you’re interested in the full version, Margaret Howard’s directions are much better and you can check out her book, ‘All Fired Up’. It’s full of good ideas. Rub equal amounts of this mixture into two boneless skinless chicken breasts, then cover them and place them in the fridge for a few hours. I think ours were in for 2-3 hours. 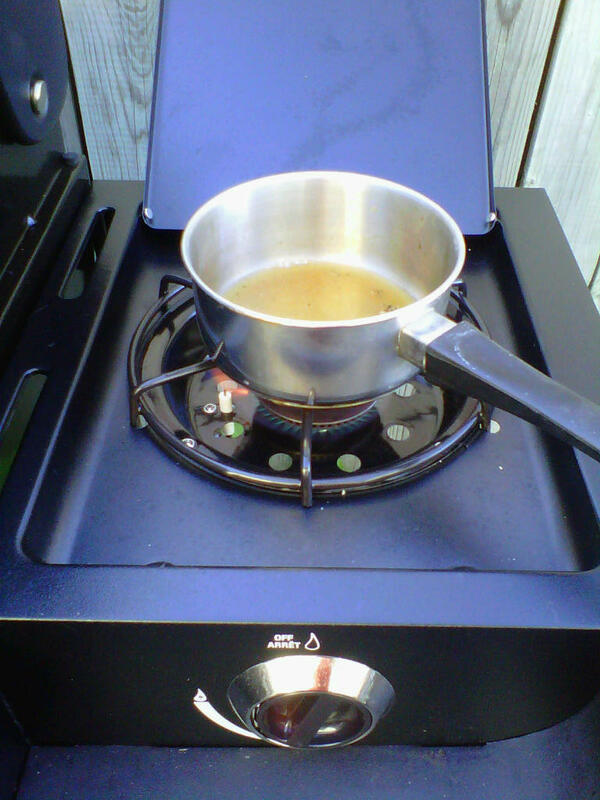 When we were ready to preheat the grill, we started the sauce over the side burner on medium. It didn’t take long to come to a simmer, and once boiling we lowered the heat to low and kept it simmering. It becomes syrupy as the sauce reduces and after about 5 minutes we deemed it done and turned the side burner off completely. Once the chicken was on the grill, we turned it four times (every 2 minutes or so) and basted it each time. Ultimately, this required all of the sauce. The resulting chicken was juicy, and we served it up with rice and steamed broccoli, which complimented the chicken really well. The combination of lemon and cayenne gave it a zesty tangy flavour that was entirely different than our previous barbequed chicken… Not a bad end to a long weekend! 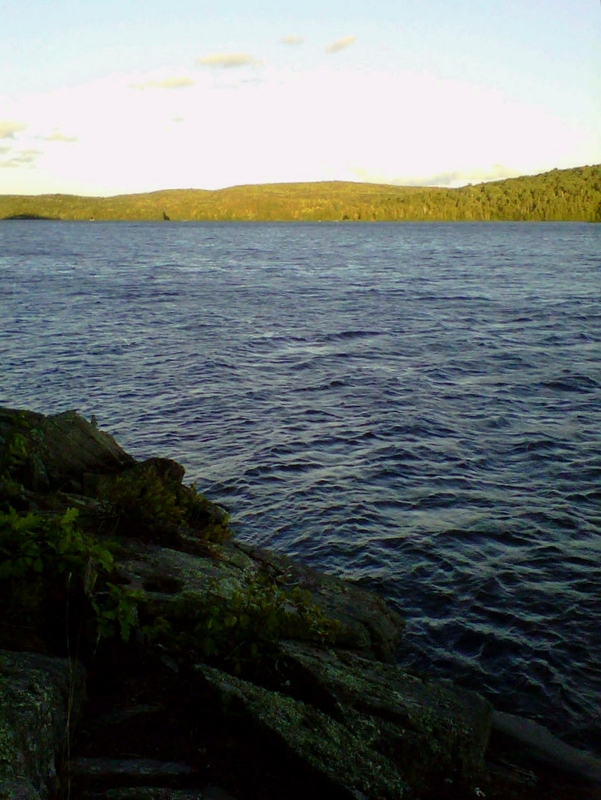 Welcome to the Canadian Shield: rocks, lakes +trees galore! But, thankfully, we’ve never been all that far from a grill. Over the past week or so, we’ve enjoyed steaks expertly grilled by my dad, some s’mores made with kids just learning to roast marshmallows, and a few juicy burgers made beside a lake after a marathon game of Monopoly. It doesn’t get much better than that. We couldn’t do any grilling over a campfire due to the recent drought and the resulting fire ban, but on our night to cook we used the barbeque at our friends’ cabin to cook up some tilapia fillets in foil. We made pouches with 3 fillets each (barely overlapping) and seasoned the fish with salt & pepper, lemon juice, a few dabs of butter, and some minced garlic and onion before sealing up the foil pouches. Grilled on high for about 20 minutes the fish turned out pretty well, and I think it would work with pretty much any solid white fish. As with most meals, however, my favourite part was dessert: grilled pineapple slices served with Greek-style honey-flavoured yogurt. We will most definitely be doing that again. I’ve seen quite a few pineapple recipes that involve coating the pineapple with some sort of flavouring and I’m sure that would be delicious, too, but we just did straight pineapple sliced about 1cm (½“) thick. The juices essentially caramelized all on their own. Alas, it was a little dark by the time we finished and I only had my phone to take photos with so you’ll have to take our word for it that it worked! 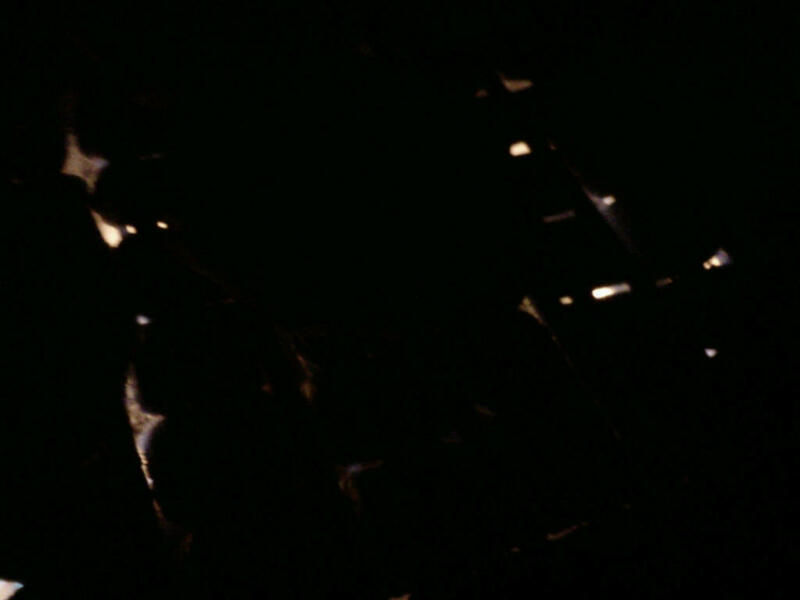 Barbeque by night… this is the pineapple. A few years ago, I spent some time working as an interpreter in a couple of historic house museums. Food is one of the perks of having the kind of job where you spend your days in the costume of an Upper Canadian settler of the 1830s. (It’s also handy for developing your post-apocalyptic skill set, if that’s something you think about.) In a historic house it seems that something’s always cooking on the hearth or in the cast iron stove. Lately I’ve been thinking about the brick bake oven we’d use on bake day. We would build a fire in the bake house oven and keep it stoked until the bricks were white hot. The residual heat of the bricks stays hot for hours – long enough to bake all the bread, pies and cookies for the week. Cookies were always the last thing baked in the oven, and as I was staring at the temperature gauge on the barbeque the other day I started to think about how cookies could just as easily be baked on the grill using a pizza stone. So I googled it, and sure enough there are other intrepid folks out there who have tried it. And succeeded. The best recipe and directions for baking on the barbeque that I came across were by SomethingEdible (a blog which has plenty of excellent non-barbeque related recipes and info as well). So today, after a week of thinking about it, I finally went ahead and made Applewood Smoked 100% Whole Wheat Sugar Cookies. We have a propane grill, so I preheated it (with the pizza stone and a smoker box of applewood chips) to about 375F and set it up for indirect heat. The full recipe, including photos, is in the link so I won’t include it here except to say that I used 1tsp of vanilla extract, and sour cream instead of the buttermilk. The measurement on the flour was about 1½ cups, maybe a little more. But you know what’s better than one batch of cookies? TWO batches of cookies! So for purely scientific reasons, I obviously had to try another kind of cookie in order to compare and contrast. One that would taste equally good baked in a smoky barbeque. Gingersnaps! 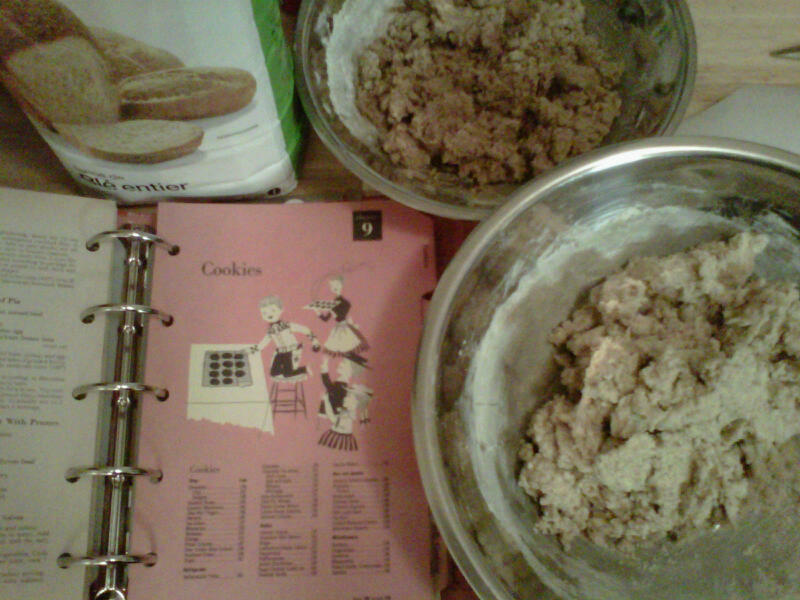 Gingersnaps and sugar cookies, waiting to happen. Burnt. Very burnt. 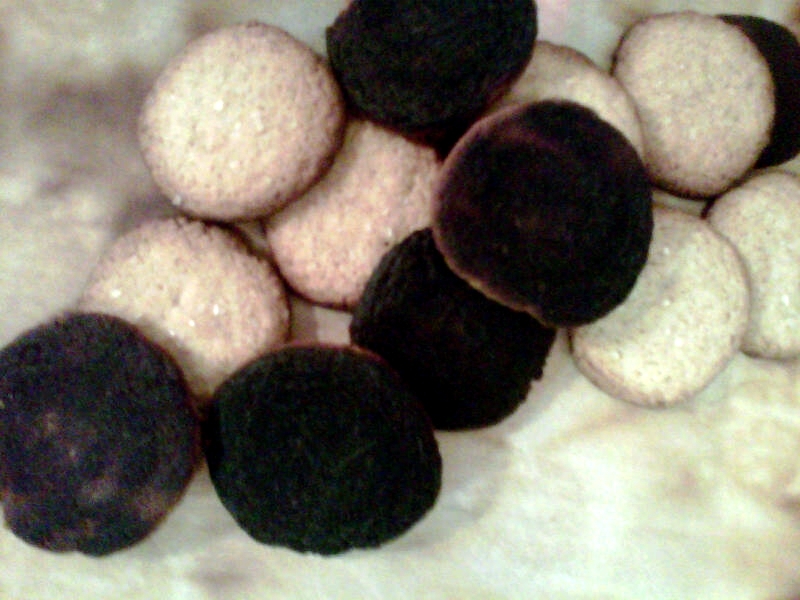 The temperature of the stone and the grill was obviously a bit too high and charred the bottoms of the cookies. Not to be deterred, I tried one more sheet of sugar cookies and saved just enough dough to do a few cookies in the oven. I also lowered the heat (just over 300F) and reduced the cooking time of the second batch to about 6 minutes. This time, they were perfect. I then cooked the gingersnaps exactly the same way, and the results were pretty good! I even managed to salvage a couple of the less burnt ones by eating them with some maple walnut ice cream. For anyone planning to attempt this, I found that the parchment paper was pretty easy to slide from the pizza stone to a large cutting board, allowing for the transfer of cookies without moving the stone. The comparison cookies (about 6 cookies of each kind) were done in the oven at 375F for about 8 minutes. Sugar cookies, fresh off the grill. Perfectly golden. Hubby approved of the sugar cookies. He’s never been much of a gingersnap fan, but both turned out well. I’m really glad that I did the comparison with the oven cookies because if I’d just made the barbeque sugar cookies and tried them, I’d have thought they were yummy but maybe not all that different than any other good cookie recipe. But the cookies that were baked on the barbeque had a depth of flavour that the ones baked in the oven couldn’t match. 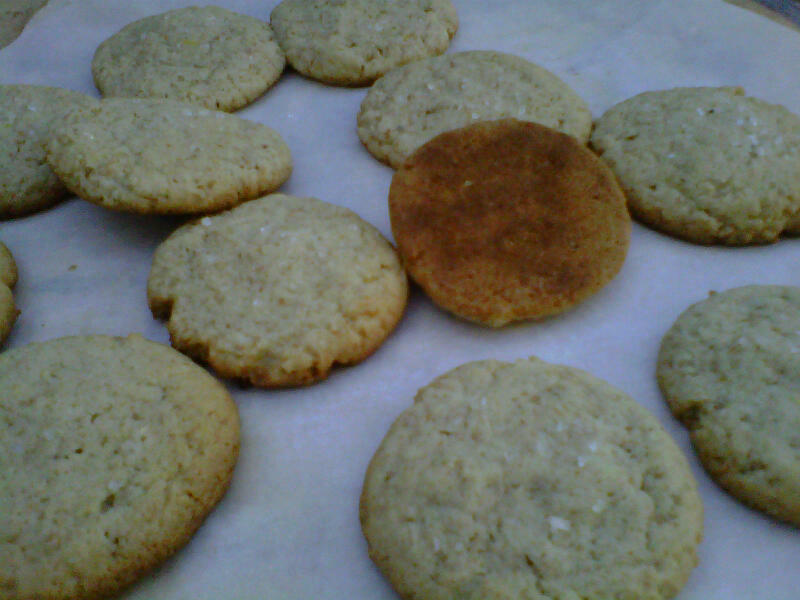 The lemon zest made the sugar cookies stand out, and the smokiness reminded me of cookies baked in the woodstove. Old timey and delicious. Then I started thinking about the recipes in some of the historic cookbooks I still have. You know, the kind of recipes that ask for a “quick oven” or a piece of butter “the size of a walnut”… I bet there are some great recipes in there, just waiting to be adapted to the grill. Welcome to the weekend, friends! Nothing complicated or adventurous here, just good food. We’re on vacation this week, and that probably means that we’ll spend a little extra time with the barbeque trying something new. It also means that we’ll spend a little extra time at other people’s barbeques enjoying the fruits of their labour (and blogging about it if they’ll let us!). But today, we’re easing into the weekend and keeping it simple. I was craving a ballpark hotdog, so I fired up the grill and hubby added a couple of burger patties from the freezer for himself. As unglamorous as that sounds, they look pretty good, don’t they? Since corn is in season now and the grilled corn was such a hit last time, I also added a cob to the grill. In the spirit of keeping it simple, I didn’t use any oil or melted butter while it was grilling this time and only added a bit of butter and salt just before eating. The result was an equally delicious if slightly smokier flavour, and it totally worked. Kudos to these hotdogs, too. We’d never tried them until a couple of weeks ago, and they’re my new favourites. You know how infuriating it is when the tiny regular hotdogs only take up about two thirds of the standard sized bun? And then you get to the last bite and it’s just bread and ketchup? Well that’s not a problem here. The bun in the photo is a bakery panini roll and it’s a perfect fit. 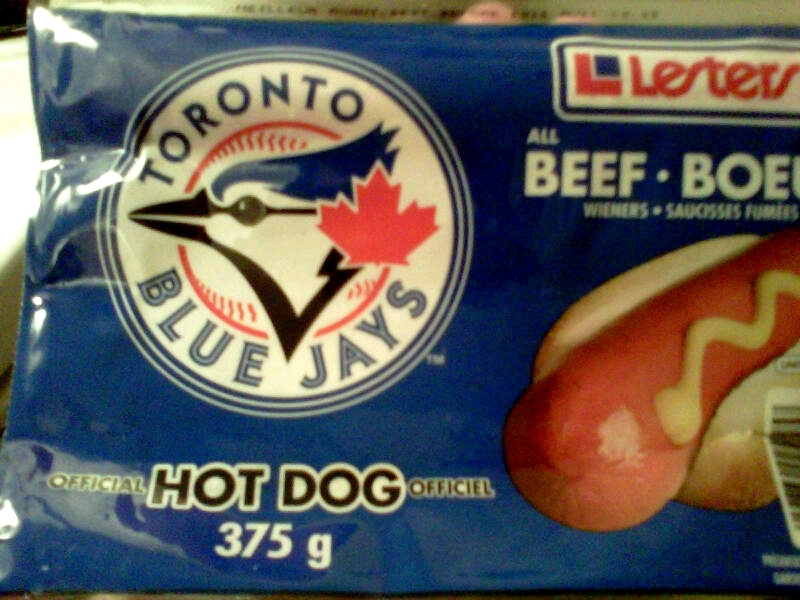 Ah, Lester, you make a delicious hot dog. 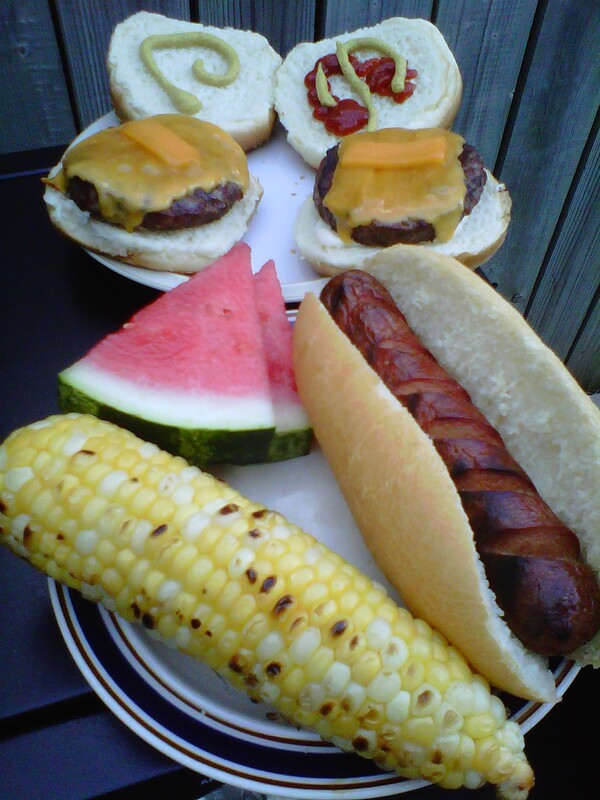 Burgers, hot dogs, corn on the cob, watermelon, baseball. It must be summer! Enjoy. Another hot summer day, another reason to grill. 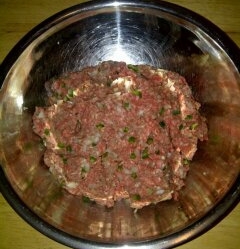 Today hubby decided to make burgers from scratch without a recipe, and this is the result. A beautiful homemade beef burger, fresh off the grill. All ingredients were combined in a big ol’ mixing bowl and chilled in the refrigerator for a couple of hours. Just before shaping into patties he added a few tablespoons of water and mixed it one more time. He grilled them on medium-high for a few minutes until the outside was cooked, then lowered the heat to medium and cooked a few more minutes until the juices ran clear. We put the cheese on for the last minute or so. 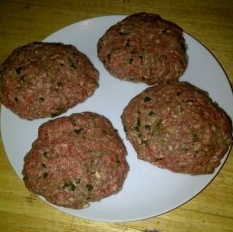 The cooking time will vary based on the size of the patties used, and hubby’s not one to scrimp on a serving of meat so he made four big 1/2 lb patties but you could try eight 1/4 lb burgers and they’d cook up a little more quickly. He topped his with tomato slices, cheddar cheese and mayo. 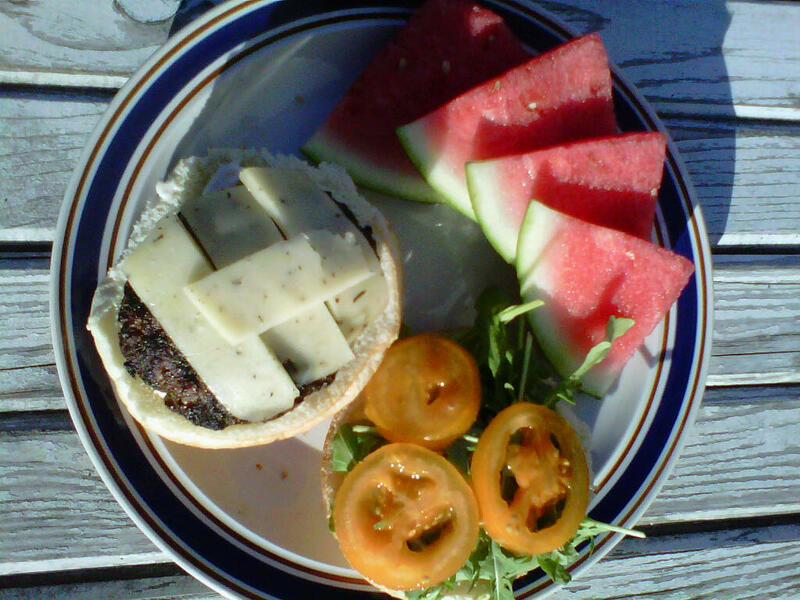 I topped mine with arugula, fresh orange tomato slices, light mayo, a few slices of black truffle mozzarella, and a side of fresh watermelon. Does it get any better than that? 1. 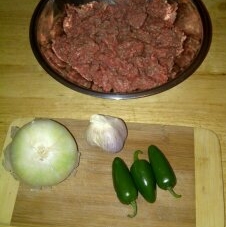 These simple ingredients want to become something awesome. 3. Put me on the grill. Now kids, I’m not advocating that you fire up the grill after 10pm when you’ve had a couple glasses of wine. But if you DO choose to do that, you should try these delicious barbequed banana boats because that’s exactly what I did and they were AWESOME. I’m a sweet tooth and hubby is not, so this one is all me. 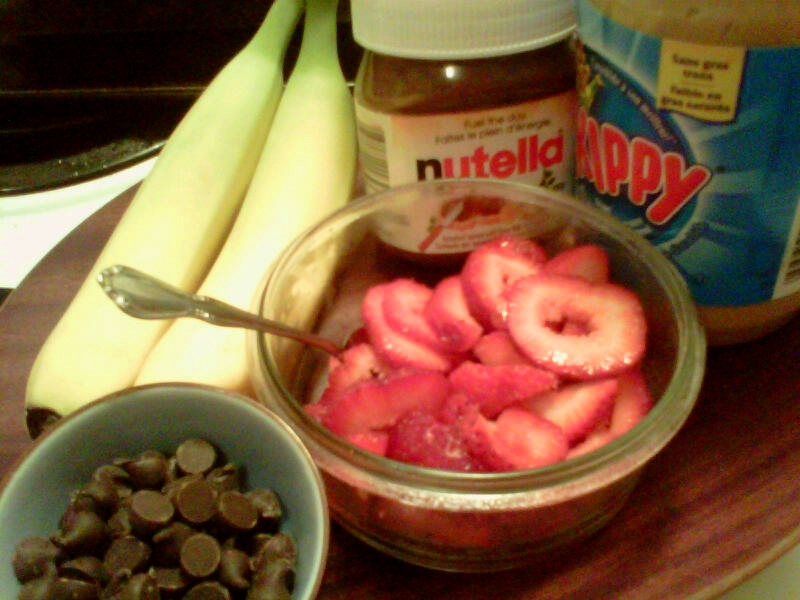 All the fixings: bananas, strawberries, peanut butter, chocolate chips and Nutella. Does it get any better than this? And you know what? They were totally worth using all of the commercial breaks during ‘Masterchef’ to try this recipe. They were wrapped in heavy duty foil and took about 4 minutes per side over medium low heat. I used a spoon to eat them, but the recipe says that it would taste great with ice cream and that’s probably true, too. Best 8 minute snack ever. Then… please triple-check that the barbeque is off because wine might make you peckish but it doesn’t make you smart.